Over the years I have heard many travellers say the fear of contracting Norovirus on a cruise is stopping them trying cruising. Norovirus is not unique to cruise ships, and is surprisingly prevalent on land. I have not suffered from it despite being on over 50 cruises, including three where there has been some form of outbreak. Knowing what it is, how to prevent it and what to do if you get it is key if you are thinking of cruising. 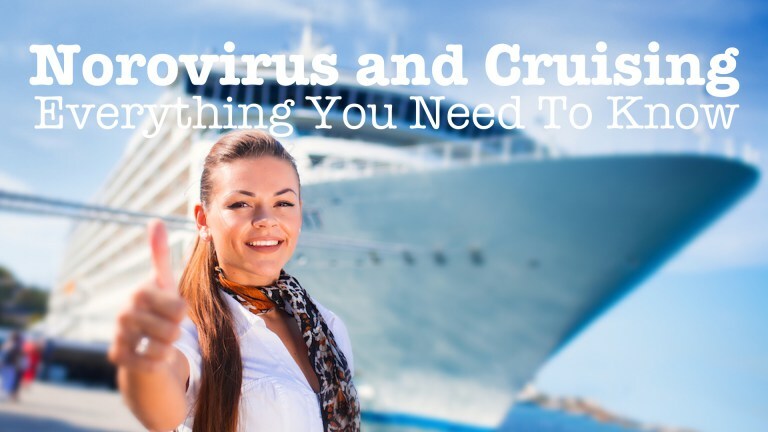 In this article and video I share my tips on how to best avoid contracting Norovirus on a cruise, and what to take with you if you are unfortunate enough to catch it. It is a form of gastrointestinal illness and usually causes nausea, vomiting and diarrhoea. People with it can also have headaches, fever and stomach cramps. It is not unique to cruise ships and is also a relatively common problem on land. Health authorities estimate that up to 20 million people in the United States and up to one million in the United Kingdom contract it every year. It is contagious, and spreads easily through touch. This is why outbreaks are often centred in places where people congregate or pass through, such as hospitals, schools and ships. How can you avoid getting Norovirus on a cruise? The best way to prevent contracting it is frequent and thorough washing of hands. Pre-boarding Declaration: Be honest when completing the pre-boarding questionnaire that asks if you are suffering from vomiting or diarrhoea. You may be required to stay in your cabin until it passes, but it ensures that guests do not bring it on board. Hand Washing: Wash your hands regularly with soap and water, especially after the bathroom and before eating. Be thorough and wash for at least twenty seconds. A number of Captains on ships have suggested you sing “Happy Birthday” to yourself as that is around the time you should wash. Whilst there will be alcohol hand sanitizers around the ship, these are not a substitute as they are likely to be less effective than washing your hands. Bathroom Facilities: Use your own cabin’s facilities, not the public restrooms. If you do use the latter then after washing your hands use a tissue to open the door on leaving. People Contact: Minimise direct contact, including shaking hands, with other guests or crew. On many ships the Captain and other senior crew will not shake hands even at the official meet-and-greet cocktail parties. Surfaces: Try to avoid, or minimise, touching surfaces used by other guests with your bare hands. These include handrails, door handles and elevator buttons. Early Reporting: If you start to suffer then return to your cabin and call the Medical Centre. Ships usually will not charge for consultations related to vomiting or diarrhoea. The Doctor or Nurse will visit, and you could be required to stay in your cabin until it has passed to avoid spreading it to other guests. I also tend to avoid eating in the buffet restaurant for the first few days of a cruise. This is the place where guests are touching and handling the serving implements, and so I prefer to use the main dining room. Once the cruise is underway and it seems there are no issues I then am comfortable venturing there. The symptoms tend to occur up to 48 hours after contracting the virus. There is no treatment for the virus itself. Once contracted it can take up to two days for it to clear up. So the focus is on treating the symptoms of the problem. Use an anti-diarrhoeal to reduce the frequency and extent of the problem. The Medical Centre may supply these for no cost, but I always take my preferred medication as I know I tolerate it, and works for me. I suggest you discuss with your pharmacist or doctor before making any decisions on what to take. Rehydrate after every loose bowel movement, or vomiting. Your body needs to stay well hydrated and nourished, and some medical professionals argue that water is not sufficient. They may recommend or provide products that will help to replace the loss of fluid and electrolytes (minerals and salts). The key to avoiding Norovirus on a cruise is being informed about what it is and how to minimise your chance of catching it. The key is frequent hand washing with soap and avoiding direct contact with other guests and surfaces that may have the virus on it. To help reduce the problem, and speed recovery if you are unfortunate to catch it, go prepared on every cruise by taking anti-diarrhoeal tablets, and rehydrating agents with you. Since 2005, Tips for Travellers has helped travellers make the most of their precious travel time and money by providing Inspiration, advice, tips and tricks on finding and having a luxurious travel experience on land and sea. All the content is based on Gary's first-hand experiences from travelling every month of every year for over 25 years – and visiting many destinations multiple times. Love this article by Gary. Just want to add our two-cents worth and emphasize that Norovirus is NOT a "Cruise Ship Virus". Norovirus spreads swiftly wherever there are many people in a small area, including nursing homes, restaurants, hotels, dormitories ... and yes cruise ships. The common cold is the only illness more common. Norovirus is associated with cruise travel simply because health officials are required to track illnesses on ships (and hotels/resorts dont'); therefore, outbreaks on a ship make the news...outbreaks on land barely get noticed. Just follow the prevention steps from Gary and it will be smooth sailing!